Having gone through a lot of stage-acting work, we have Shimizu, who enjoys watching, and Sudo, who loves acting. They talk about the opportunity that led them to deepen their bonds, a combination of 'plays' and 'behind the play stage'. I'd like to have a discussion focused on acting, particularly in stage-plays. You've appeared on various plays up to now, but which left the biggest impression on you? Shimizu: For me, It would be 'Taishou Roman Haikara Tantei ou Aoi Ruby Satsujin Jiken', starring Tanaka Reina-chan. I played an air-headed, clumsy police officer, a role I'd never done before, and that was a really tough challenge. I was instructed on how to do it, and was unable to make it my own. I've always found plays to be a challenge, but that one in particular was a tough one. And it wasn't with all of Berryz Kobo, it was just 2 of us, me and Maasa, so the pressure was huge. Sudo: Saki-chan seemed really worried at the practice hall. Before I knew it, she would take hold of my arm (laughs). Shimizu: That did happen (laughs). It was really reassuring to have Maasa around. I was so helpless that I'd constantly be sticking to Maasa at the practice hall. Taking the opportunity with 'Taishou Roman Haikara Tantei ou...', the both of us talked a lot about all sorts of things. It's not that we'd never talked before until that point, but we ended up at the point where we'd call each other 'Darling' or Honey' (laughs). It was like I got to see an inner aspect of Maasa, where she was even able to talk to me about what she was worrying about. So you would say that the relationship between the two of you is thanks to that play? Sudo: Saki-chan would always be silently reading the script. And we were a bit late in joining the practices. I felt the pressure, and was uneasy due to shyness. But thanks to my role where I was on a wheelchair, I was able to talk to our co-stars. Shimizu: Maasa was bold. I thought that she was great, seeing her use nicknames with all the other actors (laughs). Sudo: But Saki-chan, while you were flustered at first, you picked things up quickly, so you ended up being able to do things quickly. Shimizu: Really!? I'd always been averse to acting, and maybe because I had no confidence, it was more like I'd come to hate it. I couldn't get my head into acting at all, and even going to the practice hall was a trial. But in the middle of my second, third time doing it, while it was difficult, I noticed that I could experience all sorts of things through stage-plays. There's that great sense of fulfilment after you've finished, right? Saki-chan, while your forte is remembering the movements and choreography for live performances, you have a tough time with scripted lines? Shimizu: I'm good at remembering the moves with my body. But it turns out that I'm no good at remembering the word that I've read (laughs). Indeed, when I think back to my time at school, I could remember things that had regularity to them, like maths, but for history, I couldn't memorise things at all. I wonder if that explains the differences between lines and dancing though (laughs). Falling, throat-clearing, forgetting to bring things!? Maasa-chan, what's a stage play that left an impression on you? Sudo: For me, it'd be 'Thank You Very Berry', and after that, 'Sanokuen Shoujo'. 'Sanokuen Shoujo' was really tough, as each of us had to play three roles, but becoming 3 characters in a single play was fun. For 'Thank you...', it was nice to wear a gakuran as I played a masculine role (laughs). 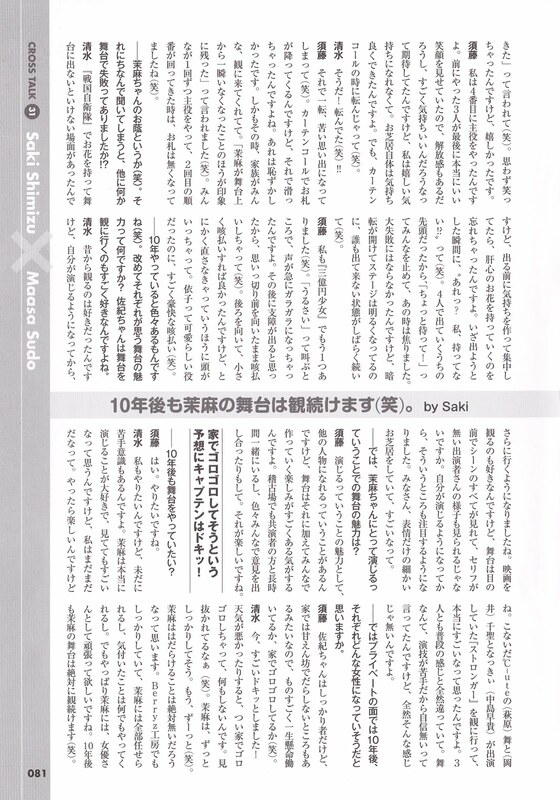 Shimizu: 'Sanokuen Shojo' definitely was tough. And it just happened that, at the time, we had all sorts of work happening at the same time, my mind was in a panic (laughs). Up to then, I'd always envied those with dialects, but the Hiroshima-ben was another toughie. I'd often ask people how to remember it. I had no idea myself. I couldn't do it at all (laughs). I had no idea which lines to say for which role, so I'd use a highlighter to colour the lines for each role. 'Sanokuen Shoujo' had the 'Rainbow lead roles', where you'd each take turns to act the lead roles, right? Shimizu: Since I surely would have been compared with the other girls, I was troubled. The first one would be Kumai (Yurina)-chan, and after that would be me, and Kumai-chan's was really well received. So I was scared, but my mother came to watch the play, which made me really happy. She told me that just being able to see me appear in a stage-play made her cry (laughs). I might have laughed at it without thinking, but it made me happy. Sudo: I was 4th in turn to play the lead role. The 3 who had gone before me had really great smiles at the end, so I had my hopes up for that extremely great sense of liberation, but I didn't feel happy. I enjoyed the acting. But, at the curtain call, I fell (laughs). Shimizu: That's right! You fell (laughs)!! Sudo: And that completely changed it into a painful memory (laughs). You'd be showered with gratitude at the curtain call, but I slipped at that point. That was embarrassing. And what's more, that was when my family had come to watch. I was told that the most memorable part was how I suddenly disappeared from the stage (laughs). Everyone did the lead role once, and when my second time came around, we didn't have a show of gratitude (laughs). I guess you could say that it was Maasa-chan's shadow (laughs). I'd like to ask about something in relation to that: have you ever had any other slip-ups in other plays? Shimizu: In 'Sanokuen Shoujo', there was a scene where we had to enter the stage with flowers, but I had been concentrating on building up my mood before going on-stage, and I forgot to bring the crucial flowers. The moment I went out, I was like 'Eh? I don't have mine!?' (laughs). SInce I was at the front of a line of 4 people, I was like, 'Wait up! ', and everyone stopped, I was in a panic. It didn't become a huge slip-up, but when the darkness was lifted and the stage was brightened, it continued for a while without anyone entering (laughs). Sudo: I've got another one from 'Sanokuen Shoujo' (laughs). I had to shout 'Shut up', but my voice suddenly went all raspy. And after that, since I thought that there was an obstruction, I wholeheartedly cleared my throat while facing forwards. It would have been fine had I turned back and given a small cough, but my mind was just telling me that I had to get it settled. Yoriko was a loveable role, yet it was a really hearty throat-clearing (laughs). All sorts of things have happened in these 10 years, haven't they (laughs)? I'd like to ask about what you think is fascinating about stage plays. Saki-chan, you really enjoy watching plays, right? 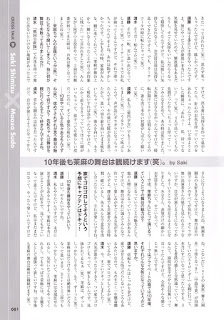 Shimizu: I've always enjoyed watching them from way back, but ever since I started acting, I've been going to even more. I enjoy watching movies as well, but you can see the whole scene in front of your eyes in plays, and you can also see the other performers who don't have lines, right? Ever since I started acting, I've been paying attention to that. I think it's amazing how everyone expresses themselves, down to the smallest details. And for Maasa-chan, what is the charm of stage-acting? Sudo: On the topic of the attraction of acting, there's the fact that you can become another person, but I also feel that in addition to that, it's amazing how fun it gets with everyone building the play up. We also spend a long time together at the practice hall with our co-stars, and all us out bring out our opinions. That's fun. made her heart skip a beat! Would you still like to act 10 years in the future? Sudo: Yes. I'd like to. Shimizu: I'd like to as well, but I realise that I'm still bad at it. Maasa really loves acting, and just by watching her amazes me, but I've still got a ways to go. But it's fun to do. The other day, I went to watch ℃-ute's (Hagiwara) Mai and (Okai) Chisato and Nacky (Nakajima Saki) appear in 'Stronger', and it was really amazing. They were completely different from how they normally are. 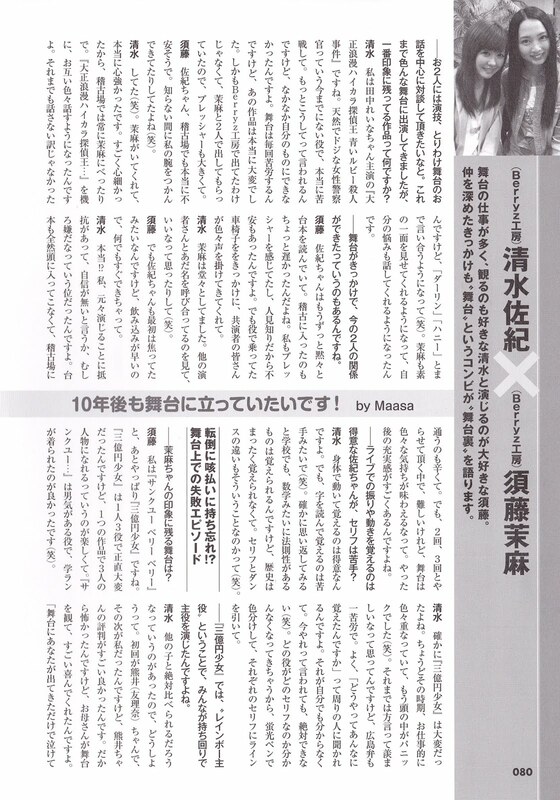 Mai was telling me that she had no confidence since she was bad at acting, but it didn't feel that way at all. Well then, in a personal aspect, 10 years in the future, what sort of women do you think you'll end up like? Sudo: Saki-chan's reliable, but it seems that she's also a pampered kid at home, so she might be working hard with all she's got, or she might just laze around at home (laughs). Shimizu: That really made my heart skip a beat! In bad weather, I'll end up lazing at home, doing nothing. I've been seen through (laughs). Maasa's always seemed like she was level-headed. Well, she always is (laughs). I don't think that Maasa's ever slacked off. She's level-headed in Berryz Kobo, we can leave everything to Maasa, and she'll take care of anything she notices. But I definitely wish that Maasa will work hard as an actress. 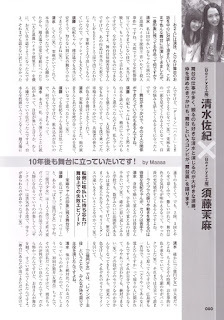 10 years in the future, I'll definitely continue to watch Maasa's plays (laughs).